Sustainability and Corporate Governance aims to provide guidance on creating a governance framework for corporations that integrates all of the recognized principles of sustainability that have emerged in recent years, which are now being discussed in boardrooms across the world. There has been a clear shift in perceptions regarding the relationship between corporate governance and sustainability. Directors now need to acknowledge that sustainability is a part of their responsibility in guiding and overseeing corporate activities. In practice, engaging with this wider responsibility is no easy task. This incomparable reference superbly meets the urgent set of challenges. This is the first book to describe how to organize board and senior management activities in order to fulfil the company’s goals with respect to operating in a socially responsible manner and acting as a sustainable business. Numerous valuable suggestions highlight allocation of responsibilities to board committees, preparing and implementing internal governance instruments, and organizing, evaluating, and improving an effective sustainability governance system. Useful tools and resources include annotated forms and checklists, summaries of relevant international and national guidelines, and samples and case studies from companies around the world. The special case of small businesses is covered in a separate chapter. This book offers solutions to questions from board members and their professional advisors about designing and implementing an effective sustainability governance framework. 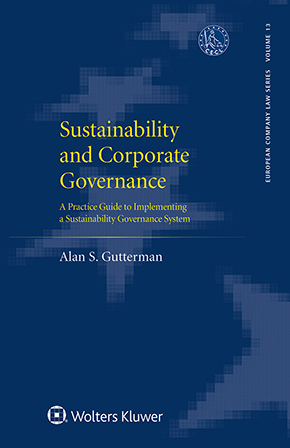 Given the redefinition and expansion of directors’ fiduciary duties beyond shareholders to other stakeholders such as employees, customers, and local communities, this book becomes an invaluable handbook for directors, policymakers, researchers, and academics involved with issues and initiatives relating to sustainability, employee welfare, social concerns, and environmental stewardship.